Relevant words are not necessarily the most frequent words since stopwords like “the”, “of” or “a” tend to occur very often in many documents. TF-IDF, which stands for term frequency — inverse document frequency, is a scoring measure widely used in information retrieval (IR) or summarization. TF-IDF is intended to reflect how relevant a term is in a given document. The intuition behind it is that if a word occurs multiple times in a document, we should boost its relevance as it should be more meaningful than other words that appear fewer times (TF). At the same time, if a word occurs many times in a document but also along many other documents, maybe it is because this word is just a frequent word; not because it was relevant or meaningful (IDF). We can come up with a more or less subjective definition driven by our intuition: a word’s relevance is proportional to the amount of information that it gives about its context (a sentence, a document or a full dataset). That is, the most relevant words are those that would help us, as humans, to better understand a whole document without reading it all. As pointed out, relevant words are not necessarily the most frequent words since stopwords like “the”, “of” or “a” tend to occur very often in many documents. There is another caveat: if we want to summarize a document compared to a whole dataset about an specific topic (let’s say, movie reviews), there will be words (other than stopwords, like character or plot), that could occur many times in the document as well as in many other documents. These words are not useful to summarize a document because they convey little discriminating power; they say very little about what the document contains compared to the other documents. Let’s go through some examples to better illustrate how TF-IDF works. Let’s suppose we have a database with thousands of cats descriptions and a user wants to search for furry cats, so she/he issues the query “the furry cat”. As a search engine, we have to decide which documents should be returned from our database. The first description contains 2 out of 3 words from the query and the second one matches just 1 out of 3, then we would pick the first description. How can TF-IDF help us to choose the second description instead of the first one? The TF is the same for each word, no difference here. However, we could expect that the terms “cat” and “kitten” would appear in many documents (large document frequency implies low IDF), while the term “furry” will appear in fewer documents (larger IDF). So the TF-IDF for cat & kitten has a low value whereas the TF-IDF is larger for “furry”, i.e. in our database the word “furry” has more discriminative power than “cat” or “kitten”. If we use the TF-IDF to weight the different words that matched the query, “furry” would be more relevant than “cat” and so we could eventually choose “the furry kitten” as the best match. Now, imagine we would like to automatically summarize some movies using their wikipedia pages. We plan to create a tagcloud that will help us to understand what each movie is about, so our task is to decide what words to put in it (and their sizes). 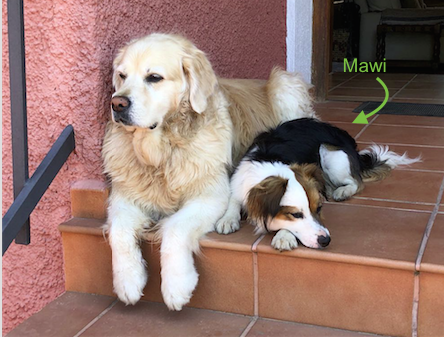 Given that a month ago my family adopted a new dog called Mawi (named after Moana’s character Maui), we will use Moana’s wikipedia page for this example. We can see that some words could be useful to grasp a little bit of the film’s plot: moana, maui, ocean, island… but they still provide very little information. Moreover, they are mixed with other words that are irrelevant and just add noise (like film, million, day, release or weekend). If we run the same experiment with other movies, we can see that the results are somehow similar regarding irrelevant and noisy words. Wikipedia pages include information that is shared or have a similar structure among all them: They are animated films that made millions of dollars since the first day of their release… but this is something we already knew or, at least, it is not relevant for us in order to understand the plot. To eliminate what is shared among all movies and extract what individually identifies each one, TF-IDF should be a very handy tool. With the most frequent words (TF) we got a first approximation, but IDF should help us to refine the previous list and get better results. Taking into account the document frequency, we can try to penalize generic words (these that appeared in many wikipedia pages) reducing their relevance. 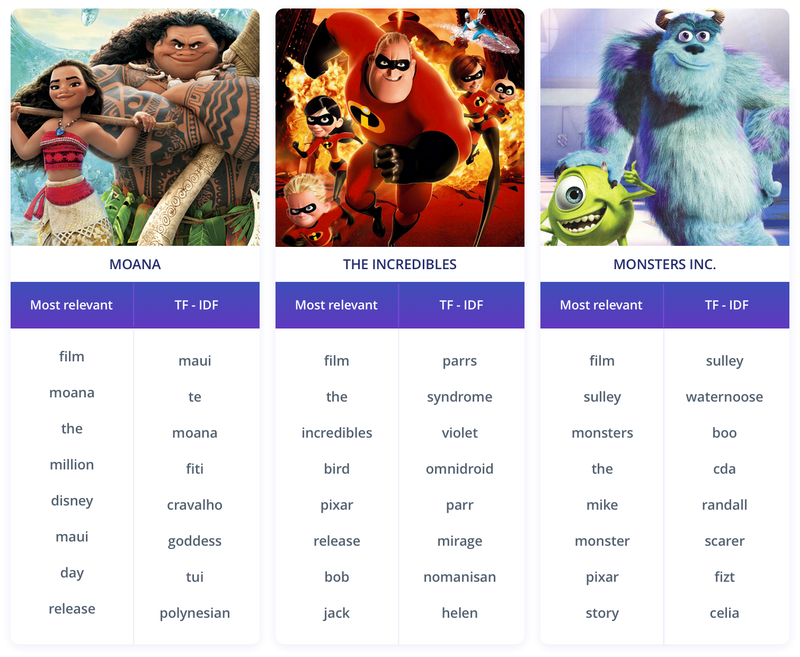 Thanks to TF-IDF words like film, million or release have disappeared from the top of the list and we got some new more meaningful words like polynesian or tattoo. For the base set of documents we have used a collection of 65 hand-picked movies. This was only for demo purposes but, to get better results with the TF-IDF, we should use a much larger document base. a) Try different weighting scores for either term-frequency or document-frequency. How do they affect the list? b) Use a different document base. What would have happened if we had chosen any movies instead of focusing on a single genre? c) How are the results if we try a different domain like music bands? Check the other articles in our Building Lang.ai publication. We write about Machine Learning, Software Development, and our Company Culture. Bio: Enrique Fueyo is CTO and co-founder at Lang.ai, working on unsupervised AI for language understanding to build products and services that help both companies and developers who have to deal with unstructured text data.